Lock in a great price for Gosby House Inn, A Four Sisters Inn – rated 8.9 by recent guests! The food was excellent, wine and appetizers in the afternoon were great. Loved the amount of windows and natural light in the room. The inn is terrifically situated in the middle of cute little downtown Pacific Grove, four or five blocks from stunning Ocean View Blvd and Monterey Bay. The Natural History Museum, Butterfly Sanctuary, Lighthouse 4 Cinema, and countless restaurants are also easy walks. Our room was huge, with a bay window overlooking the street, two comfy chairs, a sofa, and a flat-screen TV. A nice touch were the bathrobes and welcome note on the bed. The best part was the complementary (boxed) wine, coffee and snacks (cheese & crackers, or veggie sticks & hummus, plus yummy homemade cake) offered every day 4:30-6:30 PM. The staff is lovely. The food was terrific! And we loved the home baked cookies! The breakfast was great. The room was clean, but it needs work. The wall paper is coming loose. Very quiet though. Steep stairs to room. I still enjoyed myself. Breakfast was excellent and the late afternoon wine and cheese affair was lovely. The food was nicely prepared and there were several choices. Something for everyone. Absolutely loved this place. The building was beautiful, the beds were comfy and the breakfast was fabulous, especially the eggs and blintzes. I also appreciated the extra effort in accommodating those of us running the Big Sur Marathon by having food available in the (very) early morning. The neighborhood felt safe and was quite walkable. Amazing restaurants in the area as well. I also would like to point out that while the building itself is an older, historical building with a lot of rooms, it is extremely quiet. Already looking forward to booking another stay here. Oh, and Happy Hour was really nice too - cheese and crackers, veggies and good wine. Loved it! The staff is very nice, helpful and accommodating. The location is centrally located where you can walk and get to restaurants and little shops. Gosby House Inn, A Four Sisters Inn This rating is a reflection of how the property compares to the industry standard when it comes to price, facilities and services available. It's based on a self-evaluation by the property. Use this rating to help choose your stay! This historic Victorian inn is on the Monterey Peninsula in Pacific Grove, California. This bed and breakfast offers a free full breakfast and afternoon wine and appetizers. Gosby House Inn features an outdoor patio. Free water, coffee and tea are provided throughout the day. Concierge services are also available. 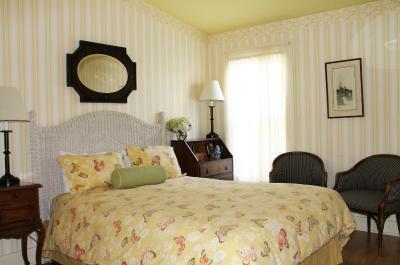 Guest rooms at the Gosby House are individually decorated and have private bathrooms. Bathrobes and writing desks are available in each room. The Monterey Bay Aquarium and whale watching tours are minutes from the Gosby House Inn. The Monterey Conference Center and California State University-Monterey Bay are also nearby. When would you like to stay at Gosby House Inn, A Four Sisters Inn? A private deck, fireplace, flat-screen TV and private bathroom with spa tub are provided in this guest room. House Rules Gosby House Inn, A Four Sisters Inn takes special requests – add in the next step! Gosby House Inn, A Four Sisters Inn accepts these cards and reserves the right to temporarily hold an amount prior to arrival. If canceled before 7 days prior to arrival, the property will refund the deposit minus a cancelation fee. Pillows were pretty weak. Bed very comfortable. Preferably the bed would be softer. Street noise was bothersome, probably mostly due to the "Good Ol' Days" street faire. The bed was a little stiff the pillows offer no support and I wasn’t a fan of the egg dish at breakfast. Loved the location and the decor of the room. Would love to see some indoor plants and fresh flowers around; it’s a Little cold feeling & not cozy. The breakfast was very good. Very friendly. The place feels like extra-terrestrials saw a TV show on B&Bs and tried to replicate one on their own planet. Instead of hardwood floors, it's wood-patterned vinyl flooring. Instead of antiques, it's scuffed, outdated furniture and faded bedding from Goodwill crammed into every common area. Instead of cut flowers, it's artificial flowers in acrylic "water" (I kid you not!). Instead of a real wood fire... You get the picture. The breakfast buffet, though certainly plentiful, was uninspired (if you don't eat overcooked eggs, it's carbs for you) and under-seasoned (except for the home-baked muffins). Our bathroom had a tiny shower, not a tub, and toiletries consisted of one small soap and lotion. Our bedroom was outfitted in drab colors and wall-to-wall carpeting. If this were Reno and I were paying 100 bucks a night, it would be wacky fun. But at $250 a night in fancy Pacific Grove, not so much. Nice nique hotel located in downtown with individual rooms, nice „public“ areas with coffee and tea. Comforter was too heavy -- like sleeping under chain mail. Nice size room and personality, nice breakfast, happy hour in late afternoon, quiet (except for 7:30 a.m. truck with back-up beeps that wouldn't stop one morning). Lousy coffee. Poor breakfast selections crepes cold ; eggs not kept warm either. thank goodness for bookstore next door great coffee and breakfast treats.